For much of his presidency, the stock market has loved President Donald Trump, trading higher on his pro-growth policies, like tax cuts, as well as his hands-off regulatory stance. But now with the stock market well off its highs, the president has increasingly become a source of uncertainty and volatility. 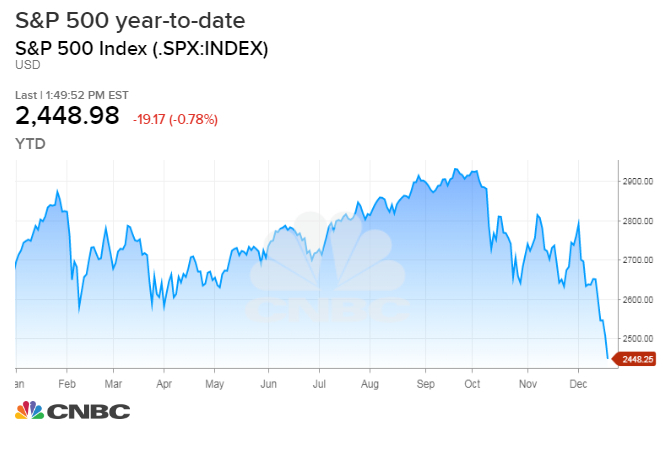 Trump and Washington politics are moving higher up the list of risks for markets, already unnerved by uncertainty over the economy, Fed interest rate hikes and trade wars. “He always has had really big pros and really big cons. Some things he did early were very big pros. He’s just created so much uncertainty,’ said Ward McCarthy, chief financial economist at Jefferies. “He seems to be destabilizing. The resignation of Mattis and the government shutdown are troubling.” McCarthy said those two factors appear to be weighing on the stock market. Stocks have fallen sharply in the past several days, against a backdrop of political squabbling over a continuing resolution to keep the government funded. The president, pushing his campaign promise of a border wall, is demanding the barrier’s funding become part of the deal or else there will be a partial shutdown of the government Friday night. Trump last week said it would be on him if the government closes down, but now he is blaming Democrats. Much of the market’s decline this week was blamed on the Fed, but the sparring in Washington was definitely a factor.